Your bedroom Feng Shui may be perfect and leave you feeling relaxed every morning. If not, then this page contains a few tips on how to rearrange your furniture or how to redecorate your room to improve its Feng Shui. Once you have read the Pah Kwa and the 8-point method, you are in a better position to improve your bedroom Feng Shui. Is the location of your bedroom appropriate for relaxation? (Click here to review the 8-point method and answer that question). Let’s focus on other ways to improve your bedroom Feng Shui. While irregular shapes are never good for chi, this is especially true in the bedroom because of the amount of time spent in this room. If unavoidable, fitted furniture or mirrors can be used to remove the arrows of bad chi and create the illusion that the room is rectangular. You should place the bed in the area of the room that best suits its purpose (northeast for family, west for pleasure, etc.) Make sure that 3 sides of the bed are accessible. Do not place the head or foot of the bed directly below a window. This does not provide enough support to the room and may disrupt sleep. Because the traditional way to take a body out of a room is feet first, the foot of your bed should not be directly in front of the door. If unavoidable, placing the bed at an angle can improve the chi slightly. Similarly, a bed should not be placed between two doors. The constant flow of chi would disrupt your sleep patterns. What About Bedroom Colors and Feng Shui? Colors will affect the Feng Shui in your bedroom. If your bedroom is small, then light shades should be used to create an illusion of space. If your room is quite large, then darker colors may be used to make it look more cozy and comfortable. How Much Furniture Should You Have in the Bedroom? It’s important not to overcrowd the room with furniture and electrical equipment such as television, radios, alarm clocks, etc. The bare minimum is better for relaxation. Make sure that sharp corners from other pieces of furniture are not directed at the bed. This would create arrows of bad chi. the water element (round and other arched surfaces). The number of mirrors should be kept at a minimum. Some believe that a mirror that allows you to see yourself in bed will create disturbing effects. 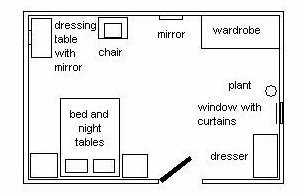 The following diagram shows an acceptable layout for this room. If you found this bedroom feng shui information useful, you may want to read Feng Shui information for other rooms. What is a Pah Kwa?